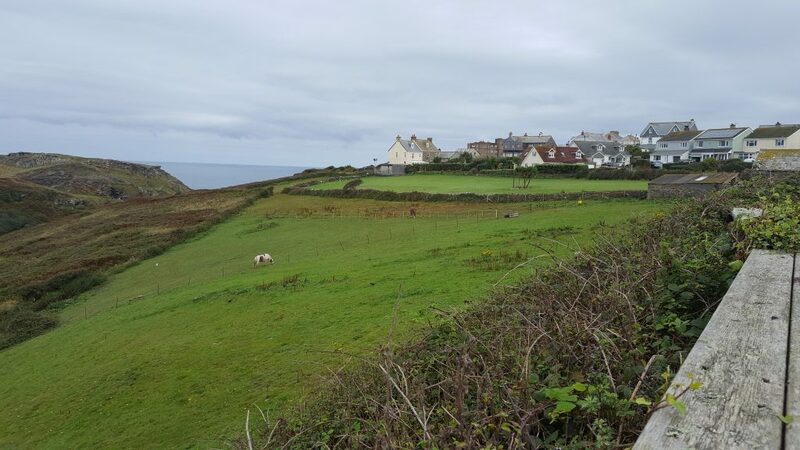 Tintagel is a village on the north coast of Cornwall (Cornwall being the south-west portion of the UK). It’s one of the UK’s most visited tourist destinations, due to its association with the legend of King Arthur. Surprisingly, this was my first visit, and I very much enjoyed it. 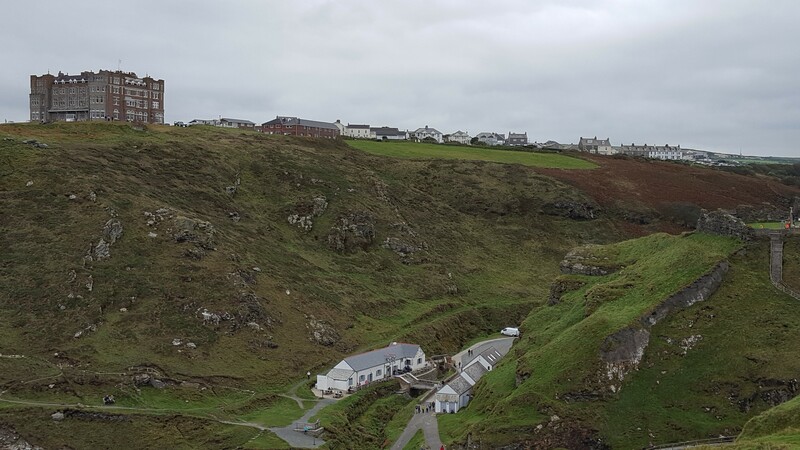 Tintagel Castle, where King Arthur was reputedly born is the main attraction, and the village is full of shops with information and tourist gewgaws on King Arthur and related items. I’m going to share some of my photos over a few posts. In this post are the general photos of the village which didn’t fit into a particular tourist spot. 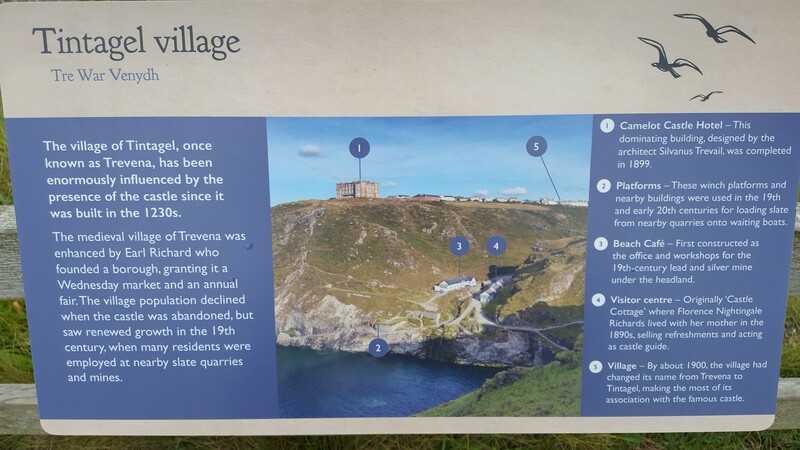 This is an information board of the view of the village, looking back from the castle, plus a photo of the actual view. The village centre is about fifteen minutes walk from the castle entrance, and you can walk the length of the village in fifteen minutes too, so it’s a fairly small place. We went in the off season and it was quite busy. It must be horrendously packed during the summer months. We walked over to the Camelot Hotel, the large brown building in the first picture, and then took a view looking back at the Castle Island. The Castle isn’t a castle in the sense of one squat little building. It’s built over the entrance to an island and is a series of sprawling ruins. Back in the day, it was basically the gateway to the secluded island in the Dark Ages. Okay, that all my general pictures. We visited some of the Arthurian locations, and I’ll do some more posts on those in the near future. I love Cornwall! My mum’s family originate from there and I recall many holidays in that area. Not been to Tintagel though. Great excuse to go back! 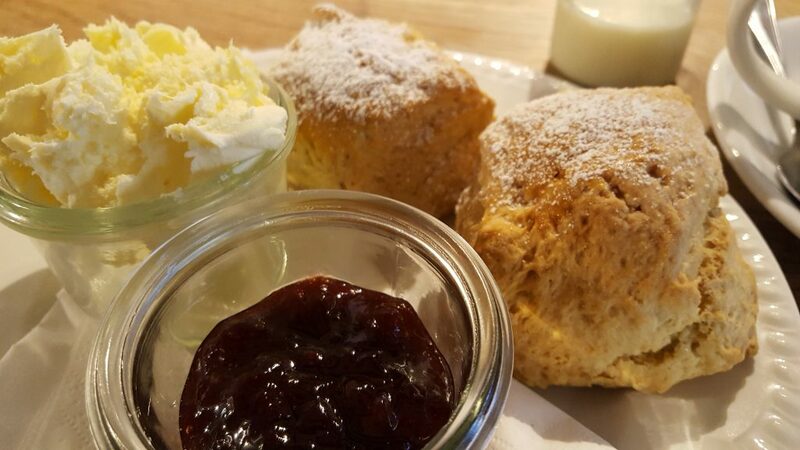 We have friends in that area, so it’s always a good excuse to visit Devon/Cornwall. Some lovely scenery around there! I love how green everything is there. So jealous! Send some of that my way! Beautiful pictures! 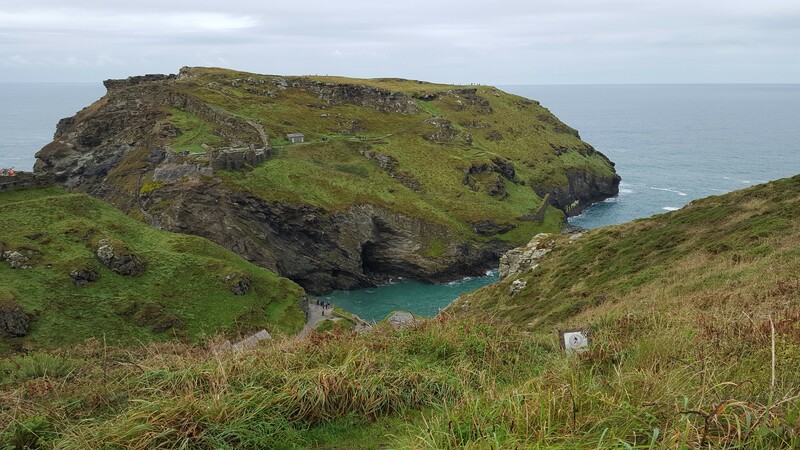 I’ve always wanted to visit Tintagel because of the King Arthur legend, but now I want to visit because of the scenery, too. But I have to agree with your husband about that poor Aston Martin–that’s just a travesty against all things sacred. 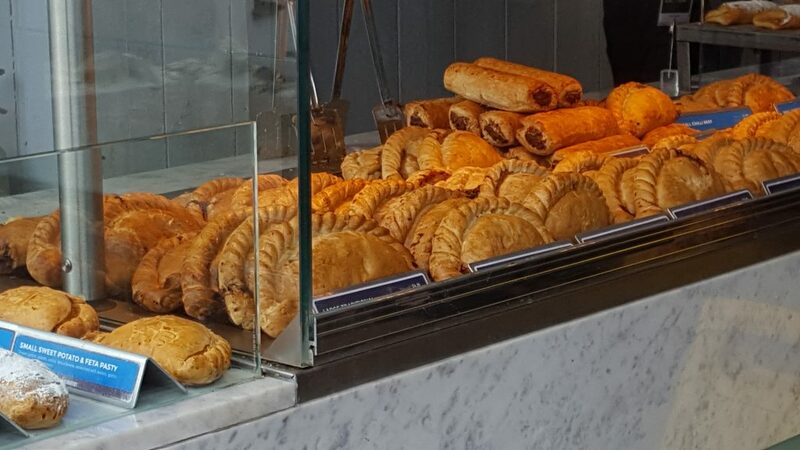 The pasties look delicious, however. 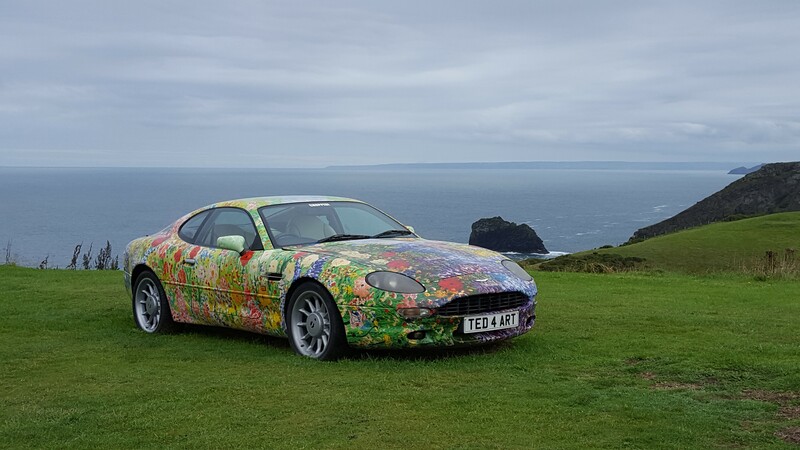 Hehe I don’t think you’d get James Bond in that particular Aston Martin! I think the Aston Martin looks pretty. And the scenery is so gorgeous! My sister and I need to stop there when we do our Europe trip in the future. 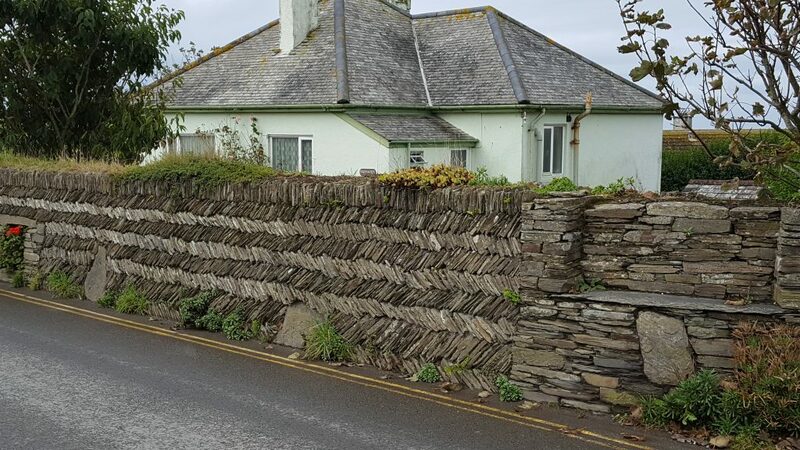 I’ve seen a lot of dry-stone walls in Ireland, but never one as fancy as that–someone spent a lot of time making it so nice! There were loads of walls like that in the end. I guess they had to do the best job they could with the local stone! Pretty though.